Reader Zack contacted us back in December when he ran into a unique and holiday themed handlebar hack. His email was well timed because I had been thinking about some of the unusual handlebar set ups we have covered on the site - it just took a little longer than I had hoped to congregate everything into this post. So here you have it, the first great hacked handlebar round up on Bike Hacks. I am sure we are just scratching the surface with this list and if you utilitize or have pictures or links of unusal handlebars feel free to send us an email. This is the "sweet" hack that Zack sent to us. The origination site is There I Fixed it. With coaster brakes the sky is the limit for what you might be able to use in place of traditional handlebars. Back in April of 2010 reader Tim sent along the following Franken-Handlebars spotted in Amsterdam. This is the first instance of such an extension I had seen for traditional drop bars. I spotted this unique set up in Manhattan in August. Maybe this person holds stock in a company that pays out dividends in electrical tape? If Wonder Woman is interested in getting a bike, maybe she can use these handlebars we covered back in March for inspiration. I believe they are made from plastic and durability is probably a huge issue, but on the style scale I give them a "10." Via livedoor.jp. Reader Tim from Amsterdam struck again in June when he sent along a picture of a giant rectangle handlebar set up - capable of making a Handlebar Ent start to salivate. Can you imagine how many different doodads could be affixed to this set up? Reader John spotted a strange set up at the Ala Moana shopping mall garage in Honolulu, HI that we posted in November. Visiting Hawaii and was at the mall when I saw a bike locked up that has a weird hack of two short rubber tubes holding a pipe between the mountain bar extensions to create a rectangular upright bar for the rider. Perhaps in a dual of tapes, I also spotted this beauty in Manhattan in September. I stumbled across a bike boldly emblazoned with it’s own appropriate name – The Predator. The bike appears to be a predator possessing a massive hunger for masking tape. Yes you can buy metal "bullhorn" handlebars, or you can go for the real thing. 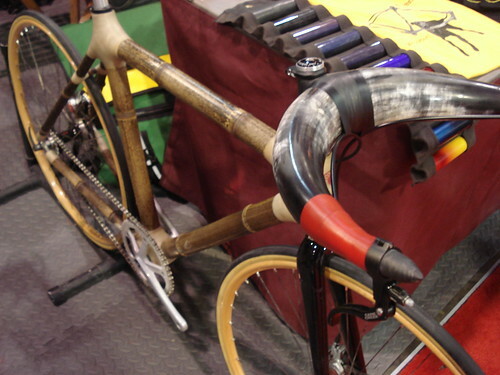 Via the Flickr photostream of ctpcpt comes the following - on a bamboo bike no less. Continuing with the animal them, these antler handlebars come via the blog PAN-DAN. I would hate to crash with this set up, I can't imagine the type of puncture wounds that might ensue . . .
On this one, I leave it to each individual's imagination to figure out what inspired these unique handlebars. Discovered on the socaleuro.com forum. The nice thing about #5 ifs that you can throw your bike into the Antarctic tundra and cause the Fortress of Solitude to appear. the bull horn is interesting, but it is legal to ride? #10 Should have bar ends, so you have something to hold on to while your riding it.